BANGI, 9 April 2012 – There is a lot of confusion about Vitamin E in general. This is more so after the publication of a scientific article in a reputable journal, ‘Nature Medicine’ titled “Vitamin E decreases bone mass by stimulating osteoclast fusion”. 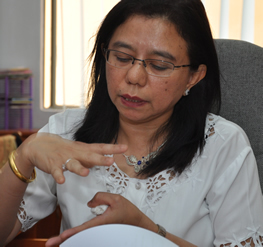 The paper published was referring to the presence of the compound alpha tocopherol found in vitamin E but not the compound tocotrienol which is also found in vitamin E which has been the subject of extensive studies by Prof Dr Ima Nirwana Soelaiman and her team of researchers at the Faculty of Medicine of the National University of Malaysia, UKM. (see accompnying story). The article did in fact showed that alpha tocotrienol did not have the same effect as alpha tocopherol, which was claimed to be linked to osteoporosis, said Prof Ima, Head of the Bone Metabolisme Research Group of UKM. Some researchers have shown that tocotrienol found in palm oil is a better antioxidant than tocopherol found in soya oil. There are even some reports that say tocopherols and tocotrienols may have opposing effects in certain situations. In her studies, Prof Ima has found that tocotrienol was better than alpha tocopherol in preventing and reversing osteoporosis. While Prof Ima does not dispute the findings of the study itself, she said that the title, which used the general term “Vitamin E” will create the wrong impression. “You have to be more specific since there are eight isoforms of Vitamin E, four can be classified as tocopherol and another four as tocotrienol,” said Prof Ima. Therefore, it should be made clear in the title, that it is the alpha-tocopherol isoform of Vitamin E that was being referred to because not every isoform of vitamin E have the same effect. Unfortunately, due to the misleading title, the mass media have started to portray all vitamin E in a bad light . She has since written to the journal’s editor pointing out the misleading heading and asking for a correction but to no avail. Prof Ima and her team are continuing their research on tocotrienol and osteoporosis and plan to develop tocotrienol as an anti-osteoporotic agent with a pharmaceutical company. They are in the final stages of animal testing and will then conduct clinical testing on humans. Once the medicine is produced and reaches the bedside, osteoporosis maybe a thing of the past.